After leaving the Winninowie Conservation Park, I travelled south along the Augusta Highway and then travelled east along the Mambray Creek into the Mount Remarkable National Park. The park is located about 60 km south of Port Augusta, and about 260 km north of Adelaide, in the southern Flinders Ranges. 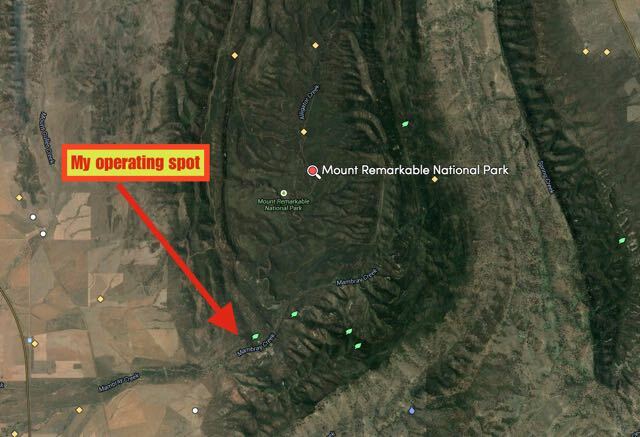 I have activated this 16,000 hectare park previously, and have climbed the Mount Remarkable summit, but I had never activated the park at the Mambray Creek section. The park entry fee was paid online, and I entered the Mambray Creek section and found a quiet parking spot on the northern side of road, amongst the scrub. Prior to activating I walked over to the old Baroota Homestead ruins. This area was once part of the might ‘Baroota Run’ which was established in 1851, and flourished for 12 years. South Australia then suffered devastating droughts for a number of years. Following the break in the drought, flooding rains and extreme cold followed. This resulted in the death of thousands of sheep, and with them, the owners livelihoods. I ran the Yaesu FT-857d for this activation, with 40 watts output and the 40m/20m linked dipole. I had the entire campround area all to myself. It was a beautiful mild night, with an almost full moon. And no mosquitos. I started off on 20m first and I was hoping to work some European DX and give the Europeans the opportunity of working a new park for the World Wide Flora Fauna (WWFF) program. But I was to be sadly disapointed. I called and called CQ on 14.250 with no takers, until finally, Jim VK2QA responded (5/9 both ways). But I was not spotted and called CQ numerous times after this with no takers. So rather dejected, I tuned across the band and spoke with Franc F5PAU (5/8 sent and 5/5 received). I then found Paul VK2HTM calling CQ with a booming signal from Sydney. Paul also gave me a 5/9 signal report in return. It was nearly 0900 UTC (7.30 p.m. SA local time), so I had probably left my run for 20m a little too late. So it was off to 40m that I headed. And my first contact there on 7.142 was with the same station I had first made contact with on 20m, Jim VK2QA in Lane Cove. I worked a further 14 stations in VK2, VK3, VK4, & VK5, until a very strong CW signal came up on frequency calling me. Wow, was this going to put me to the test. It was Jack, VK5CJC. I managed to stumble my way through and exchanged signal reports with Jack. This was the first time I had ever had a CW-SSB contact whilst in a park. Following my contact with Jack, I worked a further 3 stations on 7.142 until callers dried up. I tuned across the 40m band and heard WWFF park activator and hunter, Rob VK4FFAB in QSO with Shaun VK4NSP and Glen VK2FQSL/p, so I called in to say hello. After working Rob, Shaun, and Glen, I went up to 7.167 and called CQ. The first responder was regular park hunter, Ron VK3JP with his usual very strong signal. About 8 QSO’s later, after being placed on the DX Cluster by John, VK5NJ, I was called by Bill W1OW in Massachusetts in the USA. Bill and I had a successful contact (5/7 sent and 5/5 received). And then to my surprise, ten QSO’s later I was called byTom K2WCT in New Jersey in the USA (5/8 sent and 5/3 received). I went on to work a number of other VK’s including my good mate Greg VK8GM in Alice Springs, and a handful of VK6 stations including my buddy Ted VK6NTE with his normal very strong signal. My last contact on 40m was with Damien VK2XDL. I had a quick listen on 20m for Jack W1FDY on the Southern Cross DX Net, but all I heard were some of the local VK’s talking about how the band had not yet opened to the States. So I decided to ‘pull stumps’ and head back to Crystal Brook. I had a total of 50 contacts in the log, which I was very happy with. Although I was a little disapointed that I did not work the expected DX on the 20m band. This entry was posted in National Parks, World Wide Flora and Fauna (WWFF). Bookmark the permalink.